Large Snake Skin in old shed - What kind of Snake ? Out in our old run down shed this morning is this large skin hanging off of an old bench. Can anyone tell me what kind of snake this is from? Why is it so hard to get the right size pic for this site? 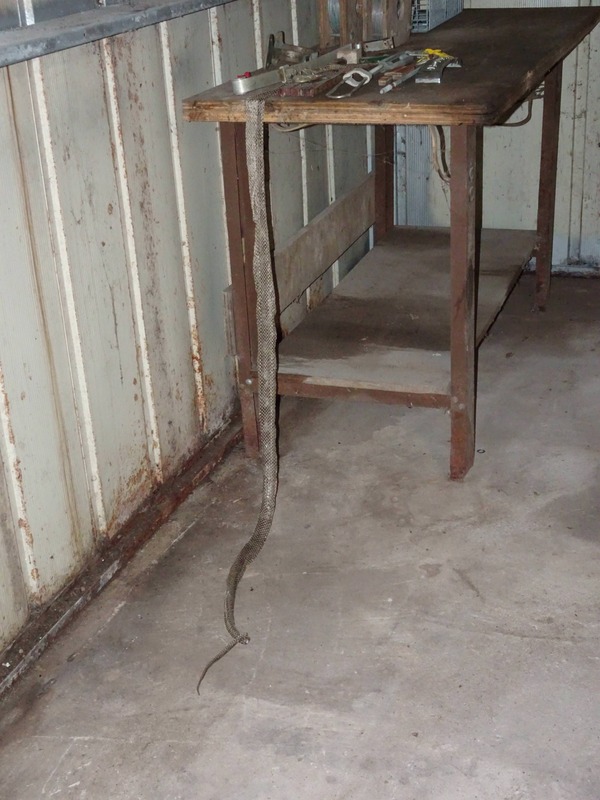 Re: Large Snake Skin in old shed - What kind of Snake ? Looks like a Kingsnake to me. It looks like a pretty good size snake. How he left his skin hanging off of that table is beyond me. Are these harmful to dogs? Also we are in northern Florida. Just measured that skin and it is 6' long. I can't tell what it is by looking at the skin. (I'm not experienced enough.) In what part of the country are you? Just going by size, in my area it is likely to be a rat snake. If it's a rat snake or kingsnake it is not dangerous to dogs unless a dog scares it, gets bitten & that bite subsequently gets infected. We have rat snakes all over our property and I've never worried about them being a danger to my dogs. Spiders are much more dangerous and ticks infinitely so. This. Also, there is no danger present to you or your dog in regards to rat snakes as they are harmless, felloffthetruck. They'll assist with keeping the rodent population on your property in check. At that size a King is unlikely, so I'd have to agree with the others and say it's a rat snake. Not venomous, so no danger to your dog. If it were to bite your dog, it would have to be on the snout or face for you to even know about it. I've been bitten by snakes that large many, many times when I was younger, and it almost always results in tiny pin pricks with dots of blood. Depending on the size of your dog, most larger dogs can even sustain a bite from a venomous Copperhead with nothing more than swelling and some pain at the bite site. Also, from the positioning of the snake skin, it looks like someone found it and placed it on the bench. Shed skins are usually around 20% longer than the actual snake, so that snake was in the range of 5 feet long which is not uncommon for black rat snakes, and good to have around to control rodent populations. That is how the snake left the skin on the bench. I'm the only one here and that is inside of a locked shed that I keep my lawn equipment in.